Today we are interviewing Anthony Roth Bouldin, author of the children's book "Tag Along With MoMo and JoJo: You’re IT! 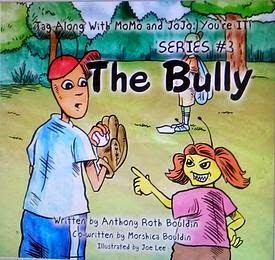 Series #3 – THE BULLY." 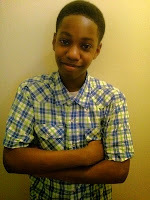 I was born in Philadelphia on the reality TV show Birth Day in 2002. Not long after, at age 7, I started writing the short stories of MoMo and JoJo on blank copy paper. Even though the pictures were only stick figures at the time, my 2nd grade teacher allowed me to read some of hand made books to the class. One day, my Mom decided to have them published and "Tag Along With MoMo and JoJo: You’re IT!" official book series was born. Describe the plot of “Tag Along with MoMo and JoJo: You're It! : Series #3: The Bully” in a few sentences. It begins where series #2 leaves off. MoMo still as the main focus and actually narrating the story. Soon he encounters a not so nice person from his past. Everyone. Lovable, down to earth characters with big personalities. Lots of humor, sarcasm and smart writing. Don’t let the animation fool you. These books are great for all ages and is sure to leave the reader yearning for more. What inspired this installment of the series to focus on bullying? As a child myself, at a very difficult age, I see firsthand how bullying is something that can turn from playful to harmful very quickly. It affects everyone at some point, so I wanted to include this topic in MoMo and JoJo to 1. Expand the depth of the characters and 2. Write something that can be used to open up more discussions about such a sensitive subject. Tell us a bit about the three main characters, MoMo, JoJo, and Tina Termite. MoMo is the big brother we all wished we had. He’s popular, cool, calm, great at everything and super athletic. JoJo is more socially awkward, nervous and introverted. He’s more environmentally aware and always striving for knowledge perfection if there is such a thing. Tina Termite is a new character created for this book. She’s sassy, spoiled and loud with a bit of a mean streak. She was created specifically for Series #3 so who knows if she’ll be making any more guest appearances as the books progress. Stay tuned! One of the unique things about the series is the books are interactive. Can you elaborate on this a bit? We want our readers to “Tag Along” as if MoMo and JoJo are their bffs and they were right there in the book. The story may pause to let readers know they can reference something from another book in the series, or point out strange things within the story. The reader is also included on the characters pages in the back of each book. The back cover also offers a variety of questions about the book, and ways to connect, via social media, with the authors and characters of the book. It’s fun from cover to cover. What’s it like creating a story with two authors? Does it make it easier or harder than writing a story alone? I created the idea of MoMo and JoJo, but having my Mom as my writing partner helps a lot. We brainstorm and bounce ideas off of each other. Like a puzzle; I may have all of the center pieces connected, but without the frame/end pieces, it’s not a complete picture. She makes sure after all of our ideas, changes, add ons, and piecing together; when finished, it’s an edited, complete book we both can be proud to present to the readers. What’s the process of getting the series illustrated like? It’s a long process because we strive to give our readers quality artwork with bright vibrant colors. We have a professional illustrator, but first my partner (Mom) and I both sketch our character ideas. Then the process of picking the right colors and shading for each character. From the scene backgrounds, hair color, facial expression, gestures, posture, etc,. This process could easily be 2-4 months of the total production time which can take up to a year. There is a lot of thought out planning into every detail of these books. Are there any authors who have influenced your style of storytelling? Charles Schulz. He was able to make everyone young and old feel connected to his characters. As if we knew them. We read every time as if it is new. We watch every year as if we have never seen it before. Simple. Timeless. Classic. That type of honorable longevity should be a goal of every writer. We have in mind where we would like to take the characters, but we may let the readers decide. But what we can say about the next project and the one after that and so on…is that they will only get better and better. 3 books in and this is truly only the beginning of where we want to take these books and these characters. Is there anything else you'd like potential readers to know about your series? Pick up “Tag Along With MoMo and JoJo: You’re IT!” today. Start with Series #1 and join in the fun. If you like to read, think, laugh, and be entertained, you won’t be disappointed. We plan on continuing to bring you quality stories every time.